I’m so glad you loved it! I was so disappointed when this film did not get a US theater release, and bought the DVD as soon as I could. It lived up to the hype! I adore the soundtrack, too, and listen to it all the time. This film is really something special, and you articulated many of the reasons I love it, too. I look forward to seeing Bhumi Pednakar in future films. What a great debut. As you said, you cannot help but love her. Thanks again, Melanie! I wish it would’ve been released here, too. It had the potential to be this year’s “Queen.” It totally would appeal to the non-Indian fans of “The Lunchbox,” as well. 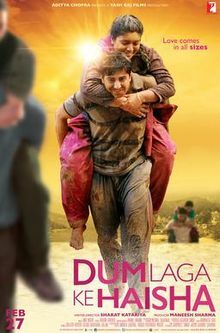 Hi – I just saw Dum Laga Ke Haisha which is available on Amazon Instant Video. Indeed it was a wonderful film about marriage, life, and love = Indian style. It was not a big production with expensive sets, fancy homes, and none of the characters wore fancy or even attractive clothes. And for all of that, it simply added to the realism. I’m not saying this is anything like reality TV, rather I am saying that it was so easy and rewarding to care about the characters. It was sharply written and even with its 1995 setting, it seemed very progressive and modern yet still traditional. As for my favorite lines from the film – at the divorce hearing the judge asks, Was it a love marriage? Sandhya, the wife replies. It was a marriage. But there was no love. Khurrana was great as Prem, but he had the easier role. Unhappy, unfulfilled, and a disappointment in nearly everything he attempted. A man defeated by his own sense of his inadequacies. It was a pleasure watching Khurrana scowl and whine and do everythinh he could to make you dislike him. But the film is stolen by Pednakar as Sandhya. Yes, she is overweight, but she’s sweet and kind despite the trials of being a part of a marriage that was doomed before it even happened. She tried hard to make it work, and she stole every scene she was in. Thanks for recommending the film. I am pleased to have watched it. I’m so glad you liked it, Mike!